Early research in dogs (Elwyn et al., 1968) showed an increase in free amino acids appearing in hepatic portal blood during protein digestion following a meal. During the absorptive period, amino acids appearing in portal blood were similar in composition to those ingested with the meal, except that glutamic and aspartic acids, which were removed by the PDV, and lysine and histidine appeared in greater amounts. Interestingly, net portal absorption of total amino acids was greater than the amount ingested, sug gesting complete hydrolysis of protein in the gut, and/or a contribution of amino acids from endogenous protein. In contrast, early comparisons of net PDV release of amino acids with amounts disappearing from the small intestine of ruminants showed that the amount of amino acids disappearing across the small intestine was 1.5-2 times greater than the amount appearing in hepatic portal plasma (Tagari and Bergman, 1978). These authors suggested that the gastrointestinal tract tissues selectively and preferentially used essential amino acids during absorption resulting in an imbalance in the profile of essential amino acids delivered to the liver. More recent attempts in both sheep (MacRae et al., 1997b) and cattle (Berthiaume et al., 2001) have measured net flux of amino acids from the small intestine by placing a catheter at a point where the venous drainage from the small intestine first enters the mesenteric arcade, prior to the junction with the ileocaecal vein (Seal and Reynolds, 1993; MacRae et al., 1997b). This approach has allowed researchers to measure net flux of amino acids across the small intestine, either from duodenum to ileum or from proximal jejunum to ileum (MacRae et al., 1997b). Interestingly, in both sheep (MacRae et al., 1997b) and cattle (Berthiaume et al., 2001), net flux of essential amino acids across the PDV, when compared with the rates of disappearance of essential amino acids from the small intestine, confirmed the apparent loss of essential amino acids between the lumen of the small intestine and the hepatic portal vein. However, mean MDV net flux of essential amino acids averaged 106 and 103% of the small intestinal disappearance of essential amino acids in sheep and cattle, respectively. Berthiaume et al. (2001) reported that recovery of essential amino acids across the MDV of cattle was 102.8, 126.7, 102.2, 92.1, 76.5, 101.1, 100.0, 114.7 and 110.9% of intestinal disappearance for arginine, histi-dine, isoleucine, leucine, lysine, methionine, phenylalanine, threonine and valine, respectively. This indicates that across the MDV, a net balance of essential amino acids occurs such that inputs of essential amino acids for protein synthesis from both luminal and arterial sources are equivalent to outputs in mesen teric venous drainage from luminal amino acid transport and/or endogenous protein degradation (Reynolds, 2001). Interestingly, the ratio of PDV:MDV averaged 61% (range = 55-69%) in sheep and 62% (range = 38-76%) in cattle, indicating a substantial use of arterial amino acids by the stomach (reticulorumen, omasum, abomasum) and other tissues of the PDV (see Bequette, Chapter 5). MacRae et al. (1997b) hypothesized that low recovery of essential amino acids in PDV compared with MDV suggests that other tissues of the GIT not drained by the MDV (i.e. stomach and hindgut) do not exhibit a net balance between arterial sequestration and venous drainage from transport and/or protein turnover. In a study with the same sheep (MacRae et al., 1997a), sequestration of arterial essential amino acids across the entire PDV accounted for 35-50% of the whole-body flux of essential amino acids. Therefore, the authors suggested the stomach and hindgut might sequester essential amino acids for tissue proteins from arterial sources at a greater rate than their degradation products are released into venous drainage as free amino acids. Alternatively, a greater portion of the products of stomach and hindgut protein degradation could be released as peptides as previously discussed. The stomach (reticulorumen, omasum, abomasum) of the ruminant has the ability to absorb free amino acids. Calculations from Webb et al. (1993) indicated that 22 and 11% of total free amino acids appearing in portal blood of calves and sheep, respectively, were from stomach viscera. The potential for amino acid absorption across epithelial tissues of rumen and omasum have also been shown in vitro with radiolabeled and non-radiolabelled methionine (Matthews and Webb, 1995). Similarly, Remond et al. (2000) demonstrated that free amino acids (glycine, serine, valine, methionine and lysine) can be absorbed across ruminal epithelium. However, the authors noted that absorption was low considering the small changes in net flux across the rumen wall relative to the large increases in ruminal concentrations. 100% complete (Gaudichon et ai, 1996; Lien et ai, 1997). However, other studies suggest that less than 100% of ingested amino acids appear in hepatic portal blood following a meal (Rerat et ai, 1992; Stoll et al., 1998; Wu, 1998; van Goudoever et al., 2000). Results of portal recovery of essential amino acids ingested are similar to ruminants (56%); as a percentage of amino acid intake, 38, 57, 54, 60, 61, 48 and 69% of threonine, leucine, lysine, phenylalanine, valine, methionine and isoleucine were recovered in portal blood of young pigs (Stoll et al., 1998). Similar results were reported by Rerat et al. (1992). Therefore, similar to the ruminant, there appears to be substantial utilization of dietary amino acids by tissues of the PDV during the absorptive process in the non-ruminant (Stoll et ai, 1998; Wu, 1998; van Goudoever et ai, 2000; and Bequette, Chapter 5). To our knowledge, rates of absorption across the MDV (i.e. small intestine) compared with the PDV have not been measured in pigs. 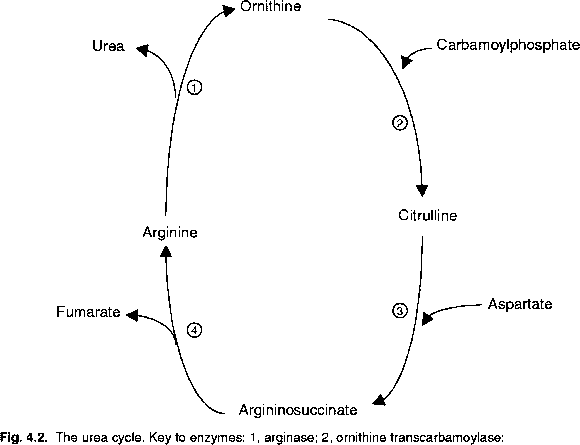 (Rerat et ai, 1992; Prior and Gross, 1995), alanine is typically the amino acid released across the PDV in the largest amount of a net basis, transferring nitrogen and carbon to the liver for urea and glucose synthesis (Jungas et ai, 1992). The large release of alanine into the portal vein also reflects glutamate transamination and glutamine catabolism by the PDV, providing energy for gastrointestinal metabolism (Britton and Krehbiel, 1993; Reynolds et ai, 1994).